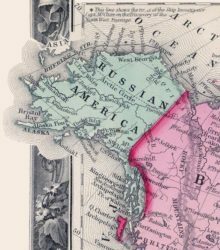 On October 27th, the Jordan Center for the Advanced Study of Russia at NYU welcomed Susan Smith-Peter, Associate Professor of History at the College of Staten Island (CUNY) for a talk entitled Selling Russian America, Buying Alaska: A Transnational History. Smith-Peter was introduced by Anne Lounsbery of NYU as the author of Imagining Russian Regions: Subnational Identity and Civil Society in Nineteenth-Century Russia. She is currently working on a new project dealing with American exploration and the purchase of Alaska. Susan Smith-Peter has published widely on topics related to Russian regions and Russian America. Susan Smith-Peter began her presentation by discussing the most common narratives surrounding Alaska in historiography: from the traditional “man against nature” narrative to detailed depictions of life in Yukon. Based on the writings of the main drivers of the transfer- U.S. Secretary of State William H. Seward and Grand Duke Konstantin Nikolaevich- Smith-Peter reconstructed the “transnational narrative” and emphasized the diplomatic aspect of buying and selling Alaska. The transfer, according to the speaker, took place because Russia and the United States, both growing dramatically, committed to different forms of state: while the U.S. was seeking transcontinental expansion, Russia was more inclined towards becoming a territorially integrated nation-state. After a brief presentation, the floor was opened for discussion and comments. An important question was raised during the panel: how the bigger concept of “empire” was understood by both nations, including the visions of territory, nation, and slavery. Following the realities of the years preceding the transfer, Smith-Peter responded, both states had to deal with questions of freedom, mobility and expansion that became particularly urgent after the end of slavery in the U.S. and serfdom in Russia. The U.S. was an aspiring empire, seeking to acquire North American territories and Caribbean naval bases, and deciding whether the new territories would be free or slave states. The country was preoccupied by how it could expand into an empire after the Civil War and yet remain a republic, while the Russian Empire was focusing on maintaining the “Russian core” during rapid expansion. A second question broadly discussed was Russia’s decision to sell. Smith-Peter points out three main motivations of this decision. The first one, named as the primary driver of the transfer by the Russian ambassador to the U.S. of the time, was the fear of incursions. Gold was discovered in Alaska, making Russians afraid of the possible influx of American citizens. The second motivation, rooted in a belief held by the Grand Duke, was that the U.S. was going to take over the entire North American continent, and it was advised to act quickly and receive money for Alaska before it was seized with no compensation. Moreover, Smith-Peter took Russia’s rapid colonization of the Amur region and the establishment of a new naval base in Vladivostok as a belief that the two countries should have spheres of influences that would not overlap in order to avoid conflict. Thirdly, the transaction was largely motivated by the emerging romanticized understanding of the Russian nationality, or “narodnost”, something that prioritized the “Russian core” within a larger empire, as well as culturally united people from different estates. Finally, Susan Smith-Peter was asked to comment on the popular beliefs held in Russia surrounding the transfer of Alaska, and whether some of them still persist into modern day. She answered that while the transaction was viewed as mutually beneficial by the contemporaries and historians, modern day Russian nationalists have made various claims, the most famous of which was that Russia never received the money for Alaska. This factually incorrect statement even found its way into a history textbook. Smith-Peter disproved the theory of “ships full of gold that sunk” by bringing in evidence that the money transfer did happen, although it was delayed by Congressional approval. On the Russian side, there was evidence that the money received from selling Alaska was invested into the Moscow-Ryazan railroad. But despite the abundance of facts, the myth persists in Russia’s popular culture and the Internet, informing claims of Russian nationalists to have Alaska returned to Russia.